Medical Macabre abounds in this collection of science-based horror stories with a theme making you cancel all your doctor's appointments in another strong issue of this roughly semi-annual anthology comic. There's a sub-theme as well, since two of the artists involved are well-known Batman artists, which may give folks an extra reason to pick it up. Jones and Breyfogle are two of my mainstream creator favorites, and it was a personal treat to have them both in the same issue. I have a feeling I wasn't the only one to feel that way, and it was a nice touch by book editor Brendan Wright to put them together like this. Ewing and Jones lead of with the best story in this issue, Shadowplay. A man sees a psychiatrist because he thinks there is a great evil inside of him. Turns out he's right, but the resolution isn't quite what he hoped, in true Eerie/Creepy fashion. Jones is the star of the show here, creating layouts and panels that use his exaggerated style in just the right way to create the perfect atmosphere for the tale while Ewing leads the reader to believe everything will be okay--until it's clearly not. Sometimes the twists in these stories don't work, but Ewing finds a way to seed in into the narrative, allowing the trap to be sprung with a few choice words and Jones' increasingly menacing artwork. Look at the variety in Kelley Jones's inks. Freed from any need to follow a style or fan expectations, Jones' art is a sight to behold. 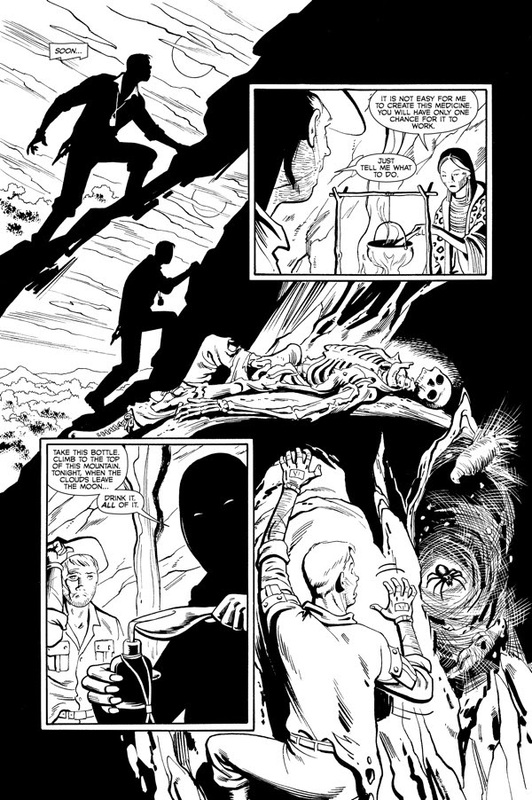 He uses a wide variety of inking techniques to create off-kilter shadows, either on splash pages or to keep the panels varied. Cousin Eerie looms over the story at the beginning, standing behind a stack of books with a great pun of a comic in his hands (Jung Romance). Large, rubbery faces alternate between being terrified and terrifying, as Jones weaves them into close-ups and medium shots, even going Kirby-esque in pulling the face right up to the reader in one instance. 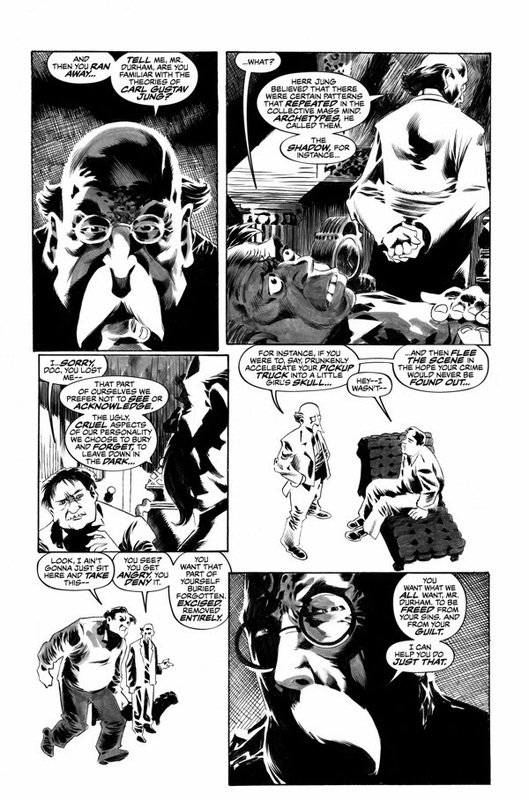 He uses odd angles to unsettle the reader, with characters almost falling out of panels in places, as he chooses layouts by effect rather than pitch-perfect narrative clarity. It's one of the best examples of his work I've encountered, with perhaps the best moment being when the patient's fear is reflected in a suddenly menacing doctor's eyeglasses, only to have him pull back later and ease the tension, which is later ratcheted up to a fever pitch as the story reaches its climax. Shadowplay does a lot to earn its name, and makes this comic worth picking up all on its own. After that story, the rest have a lot to live up to, but they do a pretty good job. Dan Jolly and Norm Breyfogle take a spin at another familiar old horror anthology trope, with a rich man seeking a way to live forever from a mysterious native. This goes about as well as it usually does for the arrogant protagonist, who meets a particularly gruesome non-end in this case. Jolly's script doesn't do anything special here, but it gets the job done, hitting all the right notes while ensuring we aren't dealing with old 1950s Jungle stereotypes in terms of the dialogue. Unlike Shadowplay, which depends on surprising the reader, this one's impact is in the horror of the cost of doing business with black magic. Breyfogle, despite using an incredibly thin style that looks like it was meant more for a full color scrip, succeeds at pulling out the stops when needed. His end page, where the man gets his punishment, is perfect. Norm Breyfogle doing what he does best. Wish there had been more of this. Unfortunately, overall, this wasn't quite the visual treat I'd been hoping for. When Breyfogle is on, like showing dead bodies, spiders, and other horrors during the man's quest, it's great work. He sometimes turns the shadows into a character, like we saw so often in Batman, too. But when we're in the city, there's just not enough going on visually. I liked this story--there wasn't anything wrong with it--yet I couldn't help but feel like there was some missed potential here. The reprint for this issue fit in well with the overall cover theme. Billy Graham, in between sermons for Ronald Reagan*, writes and illustrates a story that takes a poke at the danger of comic books. A killer alien plague attacks man, and does it from the safety of paper pulp, in some great pseudo-science plotting. The art looks quite a bit like the Warren "house style" where everyone looks very realistic and there's an attempt to make the story feel as plausible as the author can. It's done in muted grays with no fanciful creatures, and even the instruments look like they could exist. It's from a time when trying to be photo-realistic meant drawing it to look real, not tracing over a lightbox. This one might be most notable for Graham using the "comic within a comic" idea that EC and many others have used over the years, right down to an actual left hand showing up in the proceedings. I also like the cameo from comics of the different publishers, including DC and Marvel, in a nice nose-tweak. Graham is a step above others from Warren in his ability to make this story visually interesting while keeping it as normal as possible, like showing someone reflected in the eyes of another or coming up with a rather harsh way to die (even if we don't get to see it). Also included in Eerie 4 are two comedy bumpers, making fun of Kickstarter projects. Called "Ickstarter" and featuring unlikely projects, they're cute but feel quite a bit like something included to catch on to a fad. By the time this is collected, will that joke even be funny? I'm not sure. It's certainly amusing now, though I admit I thought the prose version done by Keffy R. Kehrli (Help Fund My Robot Army) worked better. I know the reasons, but I do so wish we got Eerie more than twice a year. Still, every time it shows up, I read it from cover to cover and enjoy it immensely. Horror fans should grab this at their local comic shop or on the Dark Horse digital app. *Not really. But wouldn't that be interesting if they were the same guy, and he used pulp comics to pay for his religious robes and complain against all the things he was showing in the Warren books?